What a wild weekend for weather we had in Auckland. Saturday was beautiful. We wandered around the La Cigale farmers markets in the morning, drank great coffee, ate some incredible oysters and gloated about what a mild winter we've had. Sunday morning however was a totally different story. The booming thunderstorm overnight woke me really early. In my half-asleep state I actually thought for a second it was an earthquake. I obviously have Wellington friends on my mind. The thunder woke baby Bonnie around 5.30am too so it was an early start for our whole household. The one consolation was the freshly baked sourdough loaf that was our breakfast. My loaves of recycled grain sourdough had been rising overnight so I just needed put them in to bake and within the hour we were tearing into the most amazing smelling (and tasting) bread. 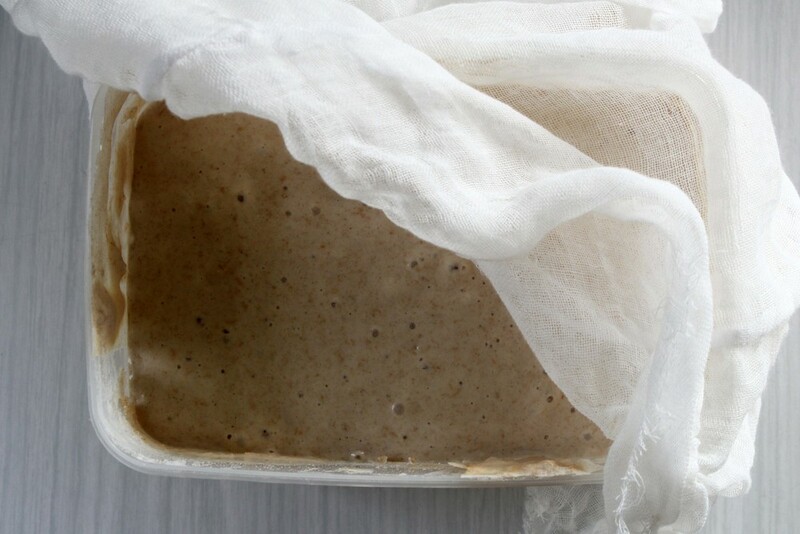 Bread gets a bit of a bad rap and is a tad unfashionable but properly prepared grains given time to ferment, leftover brown rice and wild yeast from a sourdough starter yield a bread that is traditional, delicious and worth celebrating. I used a 70 / 30 mix of spelt and rye flour. Spelt is an traditional grain that is lower in gluten than wheat and the rye flour gives a lovely rich flavor. Our bread sat on a chopping board in the kitchen most of the day. We snacked on it over the course of the day. I bought some incredible mature goat cheese from The Dairy in Ponsonby that morning. I left that on the board along with a braeburn apple. A satisfying combo and perfect for a rainy day stuck inside. This recipe is a little bit of a process and requires planning it in advance. I started it on Friday night and we had the bread Sunday morning. It's not super labour intensive apart from the kneading stage though. You just need to check in it with it a couple of times. Best of all it incorporates two cups of leftover grains. I used brown rice but you can use oats, millet, quinoa etc. Whatever you have handy. After 12-24 hours, when your mixture is good and bubbly, add the salt. Add the rest of the flour cup by cup. Stirring between each cup. After a while it'll get too thick to use a spoon and you'll to use your hands. Use a well floured bench top to knead your bread. Don't skimp on the kneading time. Spend at least ten minutes on this task. You'll reap the rewards with your finished loaf. You'll need to keep adding flour to the surface as your flour absorbs the moisture of the dough. Place the well kneaded ball of dough into a clean, oiled bowl and cover with a damp cloth. Leave this in a warm place to rise. Let the dough rise about fifty percent. The time it takes for this to happen will depend on the temperature. I left mine for about 2 1/2 hours. Once the dough has risen, separate it into two loaves. Knead each loaf for a moment more. I formed the loaves my flattening into a rectangle shape and then rolling and shaping into a loaf. Place the loaves in well oiled loaf pans. Bake the loaves in the oven for 45 - 50 minutes at 175 degrees. You can check whether the bread is ready by turning out the loaf and tapping the bottom. If it sounds hollow, it's done. Once the loaves are cooked, turn onto a wire rack too cool. Leave for twenty minutes before slicing.